The surface topography and characteristics of a local piezoelectric-response signal in isotropic films of a ferroelectric vinylidene fluoride-tetrafluoroethylene copolymer with a composition of 94: 6 are studied via scanning probe microscopy. The X-ray diffraction and IR spectroscopy data indicate that crystallization occurs in a mixture of β and γ polymorphic modifications. The exposure of the original film to a dc field bipolar leads to the formation of polarized regions exhibiting low stability. Recrystallization is followed by structural transformations accompanied by conformational transitions. As a result, there is a decrease in the concentration of chain segments in the T3GT3G− conformation and, conversely, an increase in the concentration of isomers in the planar zigzag conformation. In addition, the characteristics of the local piezoelectric response after polarization become more stable, while the signal undergoes phase reversal. A second-harmonic piezoelectric response signal induced by the electrostriction effect is detected for the studied ferroelectric polymer samples. It is found that the original film has two types of regions that contribute to the measured signal. 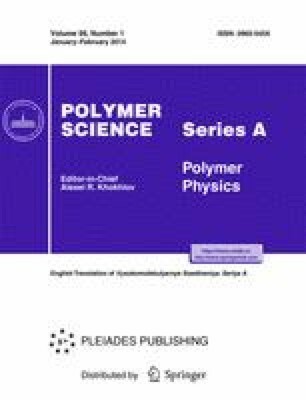 A change in the pattern of the second-harmonic piezoelectric-response signal in the recrystallized film is attributed to a change in the contribution of the electrostriction effect to the macroscopic piezoelectric response. Original Russian Text © V.V. Kochervinskii, D.A. Kiselev, M.D. Malinkovich, A.S. Pavlov, N.V. Kozlova, N.A. Shmakova, 2014, published in Vysokomolekulyarnye Soedineniya. Ser. A, 2014, Vol. 56, No. 1, pp. 53–68.